A significant increase in the California State test scores for African Descended students in the District. A realistic effort to achieve 21% African Descended teachers and an equitable increase in African Descended Administration staff in the District with a 75% retention rate. A realistic effort to achieve a 10% participation rate of African Descended Students in the District’s GATE program. A 21st Century Multicultural education with high graduation rates, high transfer to college and near zero suspension and expulsions. District staff trained in Culturally Responsive learning, restorative practices and classroom management which focuses on Best Practice Teaching Strategies and Black learning styles. A District Intervention Plan for improving Black Academic Achievement and Positive Social and Emotional Development. SCUSD must ensure that classrooms with high Black student populations start and end the school year with qualified and experienced teachers that possess the ability to relate to students of color. SCUSD must ensure that schools with high numbers of Black students are properly funded to provide the additional resources necessary for students to be successful. SCUSD must establish a No-Zero Grading policy so that low performing students are encouraged to keep trying and are not punished for the effort they're making. SCUSD must train all staff in cultural responsive learning which allows the District to take ownership in valuing diversity instead of contracting it out as a service. The District should eliminate willful defiance (disruption) as a basis of suspension and expulsion. The District should implement a classroom management system that utilizes Restorative Justice practices, Culturally Responsive Positive Behavior Intervention Supports, and school-wide cultural assessment practices for reducing student discipline referrals and suspensions. SCUSD must hire staff members that reflect the student population of the District. SCUSD must provide professional development that focuses on Best Practice Teaching Strategies and African-Centered Pedagogy. SCUSD should partner with BPSB and the African American community to improve Black student academic achievement and positive social/emotional development. 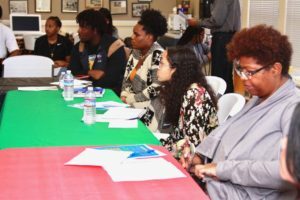 The SCUSD Superintendent should propose a budget and related staffing to create and implement an intervention plan for the improving the academic achievement of Black students.